Color can do so much for the hair. Its not just for covering those stubborn grays anymore. Color has a way of creating more body in the hair, and more texture. It can make dull hair have incredible shine. Have you thought about being a blond, a red head, a brunet or what about trying a little blue or pink in your hair? Our staff here at Hair to Stay is up on the latest color trends and techniques as well as helping you keep the color you love. 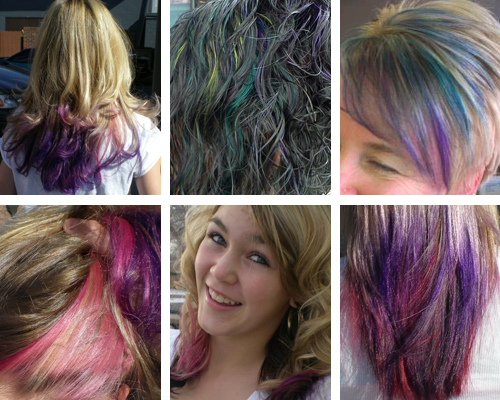 We offer permanent, semi permanent, and demi permanent hair colors. We know that sometimes box colors seem to call to us and demand our attention, so we offer corrective color services too. Don’t stress we can make your hair beautiful again. If you’re looking for a change in your style or wanting to maintain what you have, we offer a wide variety of cuts and styles that will fit you.